I replaced it with a 20A outdoor-rated GFCI outlet, and now, every time I plug the J1772 connector into the car after plugging the EVSE into the outlet, the 20A breaker that the outlet is on trips. If I reset the breaker with the car plugged in, everything works fine. No similar problems with the previous outlet, which would charge the car for a few hours before over-heating. Is it only the EVSE that trips it? Have you tried something like a shop vac to see if it trips? Was the previous outlet a GFCI? If not, is there another GFCI outlet on the same circuit (they can be wired to protect all outlets "downstream" on the circuit and more than one on the same circuit will cause issues). I assume the replaced outlet was also 20A, the breaker is 20A and the wire for the circuit is 12 ga? If not, these could also cause problems. 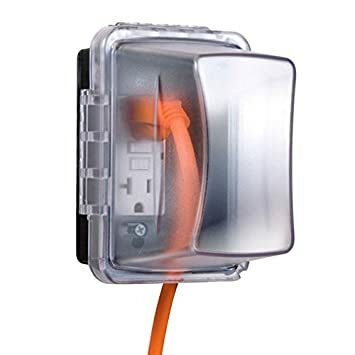 Even cheap outlets are generally rated "weather resistant", but code now requires a weatherproof "box type" cover that shields the plug and receptacle when devices are connected. The old style "grey flaps" no longer meet code. And it is also possible that the GFCI you installed in defective. I've had more than one that was bad out of the box. I did plug a vacuum into the outlet to test it and it was fine. I didn't check to see how much current it was pulling. It does have the appropriate style of box. The previous outlet was GFCI, and there is only one other outlet on this circuit which is unused. I have an outlet tester like that, but what can it tell me besides that the wires are connected correctly, which we already know since everything works when the breaker is reset? Is the breaker by chance a GFCI or AFCI breaker? What happens if you plug the J1772 into the car before plugging in the EVSE? I don't believe there's any problem with that order, although when unplugging everything, it is best to uplug the J1772 before unplugging the EVSE. Brand new wing of my office complex. 20A circuit breaker and outlet. The breaker does not trip. The GFCI does under certain conditions. During the day when a factory is running next door, line voltage is 110 VAC and the GFCI trips no matter if I use the 12 amp or 8 amp setting in the car. Nights and weekends when the factory is not running, line volatage at my office parking stall is 120 VAC. When I talked to Chevy Customer care, they said the included plug should work down to 100 VAC. The GFCI only trips when the factory is running. Proven over many days, nights, and weeks. Not a coincidence. gpsman wrote: During the day when a factory is running next door, line voltage is 110 VAC and the GFCI trips no matter if I use the 12 amp or 8 amp setting in the car. Sounds like it is the ground check on the EVSE tripping the GFCI. WAG, the factory is causing noise (distortion) on the power lines that makes its way to your office building, and the noise affects the GFCI so that it effectively has a lower trip threshold than normal. If so, then using a high quality GFCI with better noise rejection circuitry should help. Sometimes just changing brands of GFCI receptacle works, I don't know a specific brand to recommend. 99% that it is a bad GFCI outlet or problem with the installation since that is the what changed just prior to the problem showing up..
GFCI's are "fat" and often are forced into the box. This can lead to inadvertent shorts, poor connections, broken wires, terminals contacting a metal box, etc. This is more common when working on old copper - it gets stiff (and 12 ga is worse than 14). Also, some electricians routinely wrap ALL outlets/switches in electrical tape after wiring them to reduce these problems (as you found on the original install). I've had wires break inside the insulation (they still looked fine) and cause a poor connection. Was the original outlet a GFCI? If not, is this a recent enough house that the breaker is a GFCI type? It's unlikely that an exterior outlet was not GFCI protected in some fashion. So, I plugged the J1772 in first and then the plug into the outlet and the breaker didn't trip. After it was clear that that worked, I disconnected the whole thing and after a minute or so, plugged it in again, outlet first, then car, and it worked fine. In my experience, undiagnosable problems tend to fix themselves. We will see if this holds. It will be moot soon anyway when I get my Level 2 installed. I'm pleased to report no further incidents after about a week of plugging in up to multiple times every day.